Available in 4 sizes with single speed motors (PC50X, PC80X, PC110X, and PC150) the Premium CHOICE AC Standard Models, as the name suggests, is all about the CHOICE! The fans are engineered to accept S&P's PC plug-&-play options: lighted or motion sensing grille kits, and humidity sensing module, VOC sensing module, speed control module, or Bluetooth® speaker module. One fan can be modified to be the exact fan need. You even have the CHOICE to add a control or change the grille after the initial installation. The Value Series has the same great modular design as our full-size Premium CHOICE Fans at a lower price point. The PCV fans come in 2 sizes (PCV50 & PCV80) as fully assembled fans or in contractor packs with a housing 4-pack and a motor and grille 4-pack. 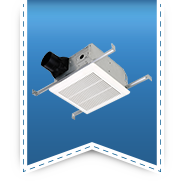 PCD fans feature the most efficient DC motors available to help improve indoor air quality and increase your home's durability by quickly exhausting contaminants and excess moisture that can cause health issues, mold growth, and structural damage. With built-in control boards, the PCD models allow you to CHOOSE your airflow. 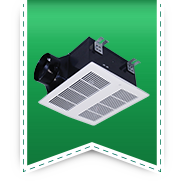 The DC fans are available with humidity sensing, motion sensing, and VOC sensing options built-in. 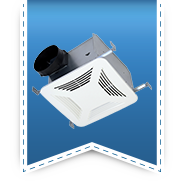 The PCD High Volume fans are designed to solve commercial bathroom ventilation issues with the most efficient motors available. The High Volume fans accept humidity sensing modules for the added benefit of worry-free commercial ventilation. The Premium CHOICE Low Profile Ventilation fans feature ultra-low profile housings suitable for both wall and ceiling installations. 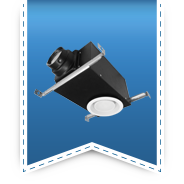 Installing a PCLP in a wall means that you don't need a radiation damper to meet fire-resistance requirements in the building code like you do when installing the fan in a fire-rated ceiling making the PCLP the more economical CHOICE for multi-family applications. 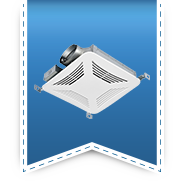 Designed to look like a recessed can light, this fan is certified to move 80 CFM at 0.1" SP. The PCRL gives you innocuous ventilation, a fan you can't see or hear!